Twenty years ago then 37 year old French pro Gilbert Duclos-Lassalle won Paris-Roubaix by 20seconds. The next year he won again by the thinnest of margins in a nail-biter, 2-up sprint photo finish, thereby becoming the oldest winner on record at 38 years and 8 months. The year after that Andre Tchmil stormed to victory in a legendary solo move. All three victories were won with a Rock Shox Paris-Roubaix suspension fork. Everyone thought those victories heralded a new era in bicycle technology, but it was not to be. Five of the next six Paris-Roubaix editions would be won by the Mapei team, whose bike sponsor Ernesto Colngao forbade his teams from using the Rock Shox product (as did fellow Italian framemaker Ugo DeRosa). Mapei was a powerhouse in the spring classics with riders of class like P-R winners Johan Museeuw, Franco Ballerini, Andrea Tafi ad well as Tom Steels, Michele Bartoli, Frank Vandenbroucke. The talent was so deep that one year Mapei swept the podium with a three-man breakaway finish (there were many photos of the finish, no one was biting their nails and I fell asleep). As much PR that Rock Shox got from P-R, when the win streak dried up they stopped pumping money into development. Where the original Paris-Roubaix fork was a development of their highly successful Mag20/21 forks, the later Ruby fork was designed for road use from the start. Strangely, it sucked. Paris-Roubaix SL fork’s greatest flaw was its noodle-like tendency for independent fork movement, not surprising considering the fact that it had a bolt-on brace connecting the lower sliders, as did the Mag20/21 product (and really all suspension forks at the time). In fact the crown pinch-clamped to each of the upper legs, rather than the press-fit type crowns now standard. The Paris-Roubaix fork did have a decent air-oil spring with a damper in each leg; 40-55psi was preferred by most racers at Roubaix. Later versions had a 6-setting adjustable damper at the top of each leg that allowed the fork to be run quick or all the way to a full lock-out. All things considered, this was cutting edge in 1992-93. But as much as it helped to tame the pounding from the cobbles, the diminished steering precision was a definite drawback. The later Ruby SL fork had the advantage of a cast one-piece lower assembly, but instead of air-oil it used the same MCU technology that became an industry-wide rage after the introduction of the Rock Shox Judy fork-series. MCU stands for micro cellular urethane, which you can roughly conceptualize as a rubber bumper with tiny air holes in it. MCU were simple and cheap because they did away with the need for tight tolerance air seals, and they were lighter than competing coil spring systems. They also had decent small hit sensitivity compared to air springs which had to be pumped hard to limit bottoming out. But MCU required disassembly for major tuning, degrade over time, and were less suitable as fork travel increased. They were also temperature sensitive, stiffening noticeably in the cold. If I remember correctly, the Ruby SL had a small metal coil in addition to the MCU stack, and it had a on-off lock-out damper. In practice, the lock-out was laughably ineffective, and the damping was so poor that the Ruby SL felt like a superball ricocheting in a metal air duct when riding on cobbles: the fork bottomed out too easily and then clunked again as it rebounded off the top of its travel. In my opinion, Rock Shox decided midway through development to change their market direction knowing that they couldn’t reasonably expect to hit another home-run like 3 consecutive wins at Roubaix; the Ruby SL was more like a sacrifice bunt at the road market while Rock Shox looked to open into casual bikes with OEM spec hybrid forks and suspension seatposts. However in the mtb market, they bum-rushed the industry again with the SID light weight, cross-country forks, bringing larger volume air-springs to make the travel more progressive and a negative-air spring to improve small bump sensitivity. Today, MCU springs are but a hazy memory, while today’s suspension forks are so much stiffer than before that it is common practice in XC forks to put positive and negative air springs in one leg and the damper in the other. 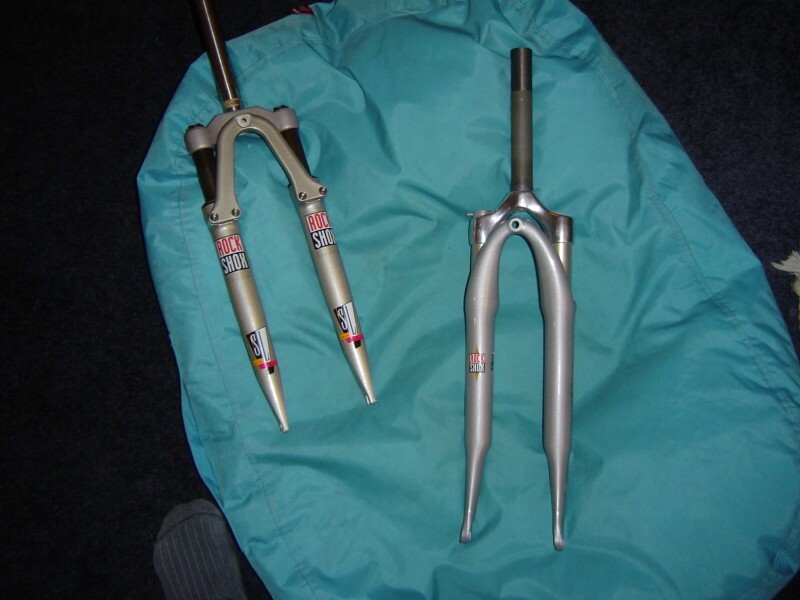 Ignoring the irony that the mystical Paris-Roubaix SL fork has more in common with a 3rd-gen SID fork than it does with its supposed successor, I really wonder what might happen if Rock Shox were to use modern technology to make a fork for Paris-Roubaix. One could argue that true suspension isn’t necessary nor even desirable in the race, but if we draw a parallel to World Cup cross-country circuit, courses are notoriously less technical than ever yet suspension travel continues to grow. 100mm is pretty much the minimum you can even buy in a XC fork. Imagine a 30-50mm suspension fork for the cobbles that had steering precision and small bump sensitivity. Rock Shox isn’t going to make this fork, however. You can’t just pop a different fork brace on and stick a new damper in the legs of a SID (like Rock Shox did with a Mag21) to create a race winner. A modern XC suspension fork is a highly developed product; long gone are the days when the Judy fork served as the platform for XC and downhill products. But if any market analyst suggested that the costs of developing a real fork for Roubaix could be recouped in consumer sales, he’d be mandated to pee in a cup. 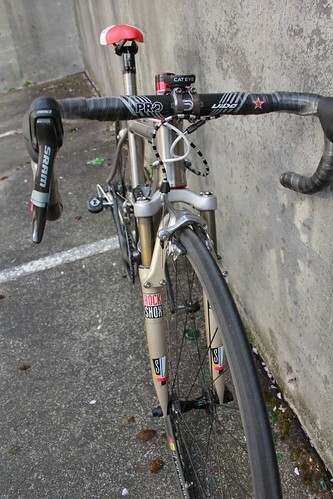 I happen to own a Rock Shox Paris-Roubaix SL fork, and I have also owned a Ruby SL. I still ride the P-R SL fork from time to time. I would love to ride it through the Arenberg sector, but mainly for the experience of it. When Duclos and Tchmil rode this fork, bikes were made of steel, integrated shift/brake levers were novel, and electronic shifting was a French nightmare called ZAP. The Paris-Roubaix SL was a product of another era, but as a concept I’m sure it was never fully realized. But hey, everyone is creaming their pants for electronic shifting again, so maybe we can’t rule out suspension forks making a comeback.